I’VE been a member of the RNLI’s Shoreline group for nearly 40 years. So has my wife, Julie. Lots of people who spend time messing about in boats support this wonderful organisation and regularly donate or fundraise to help the institute but we both have a very special reason for backing the RNLI – because they once rescued us off the English south coast. In August 1974, before Julie and I were married, we were invited to join my brother – OlderMort – and his then wife, Liz, during their holiday at Seaford in Sussex. My brother had just finished rebuilding an old Scottish fisherman’s dory and had rigged it as a sailing boat – it was a beautiful thing, gleaming in coats and coats of varnish and looking very much a tidy sea boat. The three of us – Liz wasn’t into sailing – decided to take it out from the beach at Seaford late one Saturday afternoon and sailed the old boat downwind away from the shoreline. It went like a veritable train, almost planing on the waves and giving us a fabulous ride. Until, that was, we turned to come back. Beating into a choppy sea and having to tack frequently, we discovered that the old boat had one problem – no cap on the centerboard case – which meant that the water was shooting up and into the boat every time we hit another wave. We tried bailing but it was a losing battle and in a very short time we were sitting up to our waists in very cold water, being steadily carried out into the English Channel on the flood tide. Fortunately, the boat had buoyancy bags fitted so at least we stayed afloat. My brother, God bless him, had the foresight to pack some flares and we let all three of them off before, very faintly in the distance, we heard the lifeboat maroons go off. Shortly afterwards, we could just see a tiny tongue of white foam – which turned out to be the bow wave of the Newhaven lifeboat coming out of the harbour, now some four or five miles distant. I’ve never been so glad to see the RNLI who arrived, took us aboard and then towed our waterlogged boat back into the harbour. Volunteers to a man – as they still are – they didn’t give it a second thought – just dropped everything and came to rescue us. A fantastic team who deserve all the support and respect they get. 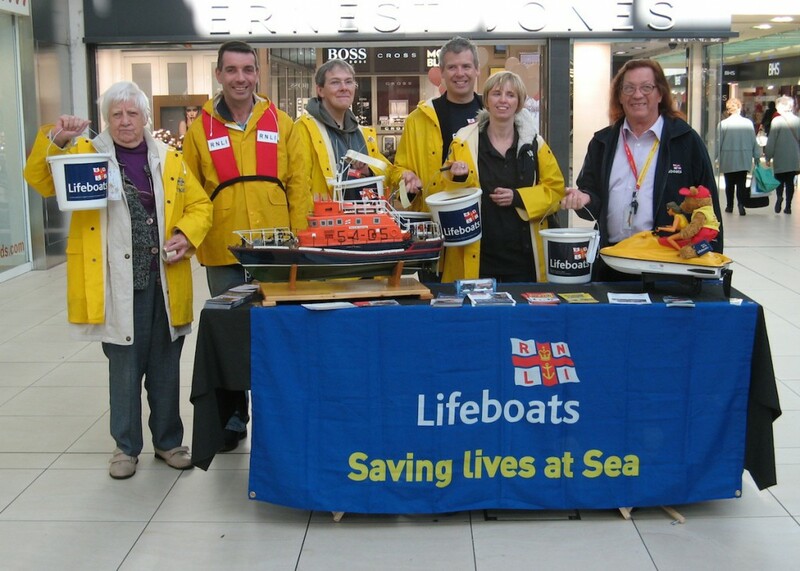 In light of that experience (and all three of us learned a salutary lesson that day) I am delighted to publicise the activities of the Egham and Virginia Water branch of the RNLI who have recently celebrated a very successful annual fundraiser in Staines town centre. Steve Merifield, the branch chairman, expressed his thanks to the people of Staines for helping to raise £1,039.15, money that goes straight into the RNLI’s coffers and helps to fund new boats, safety gear, maintenance and generally to keep the service operating. Steve says; “The money will go towards the men and women of the RNLI who volunteer to rescue lives of those in peril at sea. And long may it continue, Steve – the RNLI really are the fourth emergency service.